This post's alternate title should be A Cautionary Tale About Avoiding Butter. What happened was I read about cabbage strudel (did ever those two words have better partners?) almost four years ago and dutifully clipped the recipe (actually, by then I think I bookmarked it) and then schlepped that bookmark around with me from New York to Berlin, from one computer to another, until finally - finally! - last week, I found myself with a small head of cabbage and a package of phyllo dough and time - PRECIOUS, PRECIOUS TIME - to make it. But when I got into the kitchen and reread the recipe for the last time before getting started, I got a little skeered about the amount of butter called for. I mean, did the strudel really need two whole sticks of butter? As much as I like to follow recipes faithfully, I just couldn't bring myself to use that much butter. It surely wouldn't make that much of a difference if I reduced a bit here and there, I told myself. Back me up, dear readers - wouldn't you have done the same thing? Gulp. The recipe comes from a little shop in Forest Hills, Queens that sells only strudel. (I am chagrined to admit that in all the years I lived in Forest Hills, I never made it to André's.) Their cabbage strudel recipe is a study in simplicity - baked, shredded cabbage flavored with salt and pepper, then wrapped in buttered strudel leaves and baked. That's it. No extraneous herbs or spices, no special sauces. As the owner says, in this recipe "butter rules." Ahem. Right. So let me admit right here and now that, yes, in this recipe, butter indeed does rule. I halved the amount that went into the cabbage and probably quartered the amount that went onto the phyllo leaves and while my strudel looked lovely and crisp and burnished and also smelled very good indeed, it needed a serious puddle of Sriracha to liven things up. But every now and then, especially when I bit into the delectably crisp bottom layer of phyllo, where all the butter had pooled before baking, I got a fleeting taste of what this strudel would have tasted like had I been a dutiful cook and followed the recipe. It would have tasted pretty darn great. Update! The incomparable Nora Ephron on this very cabbage strudel. Perfection. The end. 1. Heat oven to 350 degrees. Lightly butter a large baking pan and spread cabbage evenly in pan. Sprinkle with salt and pepper. Cut up 4 ounces (1 stick) butter into small pieces, and sprinkle over cabbage. Cover with foil, sealing edges. Bake until tender and golden, 45 minutes to 60 minutes, occasionally lifting foil and mixing cabbage, then resealing. 3. Set oven temperature to 400 degrees. In a small saucepan, melt remaining 4 ounces butter. Place a sheet of parchment paper on a work surface with the narrow end closest to you, and top with a sheet of phyllo dough. Brush lengthwise (up and down) with a little butter. Top with another sheet of phyllo, and brush again with butter. Repeat until all 10 sheets are buttered and stacked. 4. Arrange cabbage on top sheet, at end closest to you, in a thick layer 2 inches deep. Spread evenly to side edges. With the help of the parchment paper (and rolling as if for sushi in a bamboo roller), roll phyllo starting at the end with the cabbage. As you work, adjust parchment paper so that phyllo is rolled, enclosing cabbage, without the paper. Brush top of roll with butter, place on baking sheet and bake until golden, about 40 minutes. Serve hot or warm. I had a dinner party a few months ago in which everything sort of felt wrong. Not in the way you'd think - my guests ate everything I cooked (two chickens! multiple pounds of vegetables! an entire cake! a whole liter of whipped cream! six poached quince!) and there were no leftovers. But - has this happened to you? - when I sat down to eat dinner with our guests I looked down at my plate and thought, "I don't want to eat any of this". It wasn't that the food didn't taste good, I guess. It's just that - and I'm having a hard time expressing just exactly what I mean, so bear with me here - it all felt so...strained, my relationship with what I'd cooked, I mean. I'd expended a lot of time and energy on planning the dinner and cooking the dinner and then once the food was in front of me it just felt so foreign, so far away from what I actually wanted to eat, from the things that make my mouth water. It was a sort of upsetting moment - to be surrounded by nine other people kindly devouring all that was laid before them and to feel so estranged from their experience and from the very food I'd spent all day working on. Does this sound totally trite? I actually wrote a whole long post about that evening, so long that I thought about turning it into a chapter for the book, but in the end I couldn't figure out just exactly how to work it in or how to express myself, really. I mean: I threw a dinner party! The guests loved it! I wished I could have had a peanut butter sandwich instead! What? For as long as I've been cooking in my own home, when time came to plan a dinner party, I'd spend days poring over cookbooks, trying to put together a menu that made sense (as old-fashioned as it may be, I adore cookbooks that include menu suggestions) and that would be a step up from the usual stuff I eat. But after that fatal dinner party I decided that I needed to approach menu planning differently. I needed to think about what I wanted to eat, first and foremost, when I had guests over. Does that sound like the most obvious thing ever? To me it wasn't. After the dinner party that made me lose my appetite, I decided that, actually, we eat pretty darn well around here when it's just the two of us. Why, when you get down to brass tacks, should we change that winning formula just because we have people coming over? In fact, wouldn't that be just the moment to stick with the greatest hits that make us happy, dinner guests or no dinner guests? And so, to celebrate my mother's birthday last week, along with several of her closest friends and my dad, we threw a dinner party with food so good, and so familiar, I wished I could have had thirds. Instead of wracking my brains to come up with a special menu, I decided to stay simple. I'd made Judy Rodgers's chard panade many times before just for the two of us and fell in love with it a little bit more each time. When I thought about my mother's birthday, I couldn't stop thinking about that panade. It felt like the perfect January meal - meatless yet still full of richness and flavor, shot through with dark greens for our mind, a little cheese for our soul. Simple yet celebratory. I decided to eschew an appetizer and serve a salad on its own, as a second course, so to speak. Soft butter lettuce and mâche were tossed with cubed avocados and slices of juicy oranges, bound together with a shallot vinaigrette from the Zuni Cafe cookbook, which is where the panade recipe is also from. We had a few good bottles of red wine to pass around and then, for dessert, a simple chocolate mousse from Dorie's new book. The dinner was a huge success. People took seconds, thirds, licked their plates, and - thrillingly - I joined in. It felt so easy, so effortless. And my mother, a tough critic, was still raving about the celebration days later. 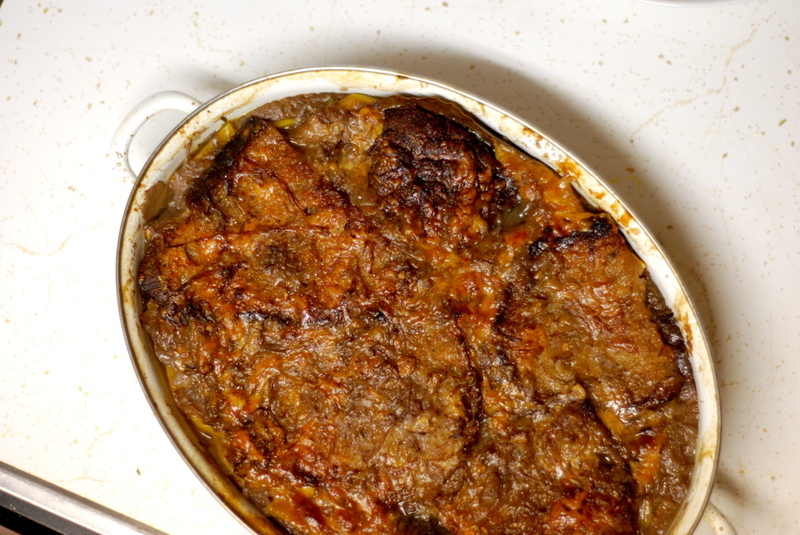 If you haven't yet had the pleasure of knowing panade, it's a cross between a gratin and a bread pudding, but only sort of. You cook a whole mess of onions until meltingly soft and amber-hued. You cube stale peasant bread and toss it with salt and olive oil and a little bit of chicken stock. You sauté Swiss chard until barely limp and still vibrantly green. 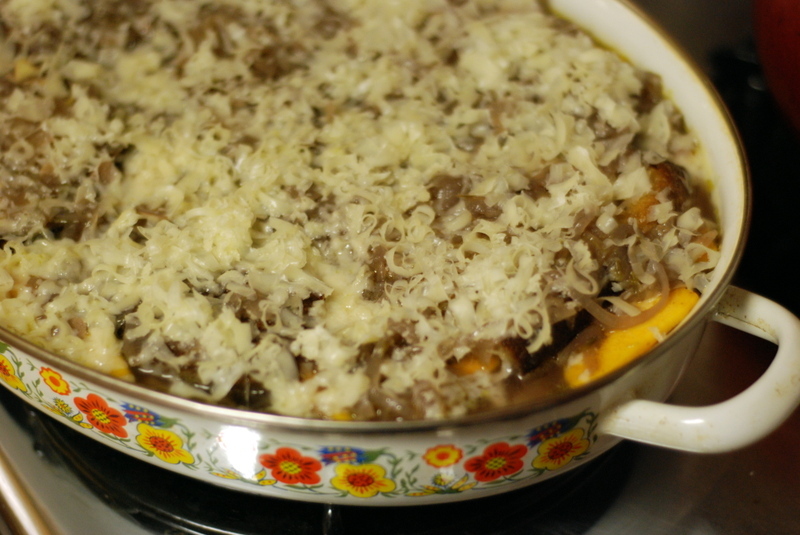 You grate a tiny mountain of fragrant Gruyère. And then you get to work, layering all four elements over and over until the baking dish is entirely filled. You soak the whole thing with good chicken stock (seriously, homemade stock pushes this dish into the sublime) and then bake it very slowly in the oven until it's plush and satiny, almost wobbling, the top crusted perfectly. Peasant food for the gods, if you will. And just the thing to make a hostess who, in truth, really does love throwing dinner parties, feel like a million dollars again. 4. Wilt prepared chard in batches: Place a few handfuls of leaves in a 3-quart saute pan or a 10-to 12-inch skillet with a drizzle of oil, a sprinkling of water (if you've just washed the chard, it may have enough on the leaves), and a few pinches of salt. Set the pan over medium heat until the water begins to steam, then reduce the heat and stir and fold leaves until they are just wilted, 3 to 4 minutes. Leaves should be uniformly bright green, the white veins pliable (the veins will blacken later if they are not heated through). Taste. The chard may be slightly metallic-tasting at this point, but make sure it's salted to your taste. Set aside. Go on! Who cares about butternut squash and sheep's milk cheese and potatoes anymore? Now it's butternut squash and long-cooked onions and stale bread and Gruyere. Seriously. Cancel your dinner plans. I'm sorry to be a boss, but you know how it is sometimes, when you make something so wonderful that you find yourself somewhat speechless as you chew? Yes, that's what happened to us the other night. We sat there, in somewhat shocked silence as we ate. (Oh, we live a thrilling life, we do.) Look at it this way: you've got to do something tonight while you wait for the results of our election to come in, no matter who you voted for. You can't just sit in front of your computer, refreshing pages obsessively, or lounge on your couch, flicking from channel to channel in the hopes that one talking head will know something before another one does. So why not kill time making a long, slow dinner that takes close to three hours from start to finish? Staying up late on a night like this is worth it. If not for the sheer pleasure of eating, then at least for your nerves. The recipe comes from Chez Panisse Vegetables and is a study in the art of flavor-building. 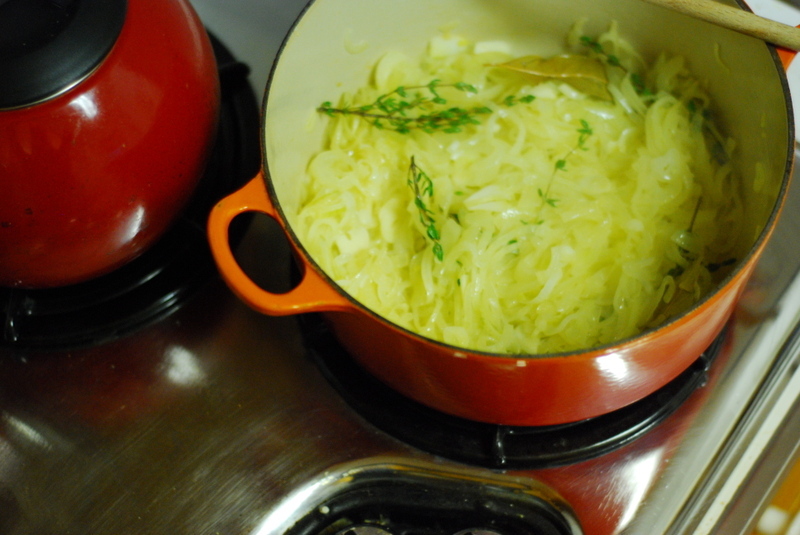 Onions are stewed with bay leaves and thyme and garlic. Wine is added and reduced, then in goes chicken stock, which simmers for a while. Good, stale-ish bread is briefly fried until golden in olive oil (or, if you happen to have duck fat lying around, you can use that, too) and two pounds of butternut squash are peeled and sliced. Then the fun stuff begins: the layering. In goes a layer of fried bread slices, several ladlefuls of herb-scented broth and a purpureal tangle of onions. Then you arrange the mass of butternut squash slices on top of the bread and ladle in more broth and onions. The rest of the fried bread makes the top layer, along with, yes, more broth and onions and finally, you grate over it all a flurry of grated cheese. What happens in the oven is very neat: the bread swells with the liquid and rises, so that the panade goes from being a rather dense, heavy thing to a light and puffy wonder. The flavors, already complex, concentrate and the cheese melts and bubbles into a wondrously tasty cap. It's hard to figure out whether you should eat panade with a fork or a spoon - or how to decide what you like more, the broth or the silky bread or the sweet squash or the cheesy top. Oh, who am I kidding, all of it. So, um, yes, I'd say that today, for sure, this is the only way you should be eating butternut squash. 1. Begin by stewing the onions, peeled and sliced thin, over medium heat, in about 1/4 cup of olive oil. When they have begun to soften, add the garlic cloves, also peeled and sliced thin; the bay leaves; and the thyme. Continue to cook the onions until they just begin to brown, 20 to 30 minutes. Add the red wine and reduce by half. Add the stock and simmer for 30 minutes. 2. Meanwhile, peel and seed the squash and cut it into 1/8-inch-thick slices. In a sauté pan over medium heat, lightly brown the slices of bread in more olive oil. 3. Preheat the oven to 375 degrees Fahrenheit and assemble the panade: Cover the bottom of a large casserole with half the bread slices and gently ladle in enough broth (including the onions) to cover. Make a single layer of the sliced squash on top and ladle in more of the broth and onions, to cover. Make a layer with the rest of the bread, add more broth and onions so that the top layer of bread is well soaked through, and finish by grating the cheeses over the top to cover lightly. 4. Bake, covered, for 45 minutes; then uncover and bake for about 45 minutes more, until well browned. To serve, scoop the panade into bowls and ladle more of the hot broth around it.